I'm pleased to be hosting the February 2009 edition of the Accretionary Wedge Geoblogospheric Carnival! The Wedge for January has been posted at Clastic Detritus. So it is time to start thinking about February's wedge. I hope you have some fun with it! What are the places and events that you think should all geologists should see and experience before they die? What are the places you know and love that best exemplify geological principles and processes? It would be great to have a truly international list. I also want to get a list of those places that don't always make the "must visit" lists. And why should this place be included? Pick one or three, or seven, and note them in the comments to this post, or e-mail me at hayesg AT mjc.edu, or send me a link to your blog, if you have posted something there. A brief example from my own backyard. Yosemite Valley was on the 100 things list. And it is a truly wonderful place to visit, and I do so whenever I can. It is precious to me. 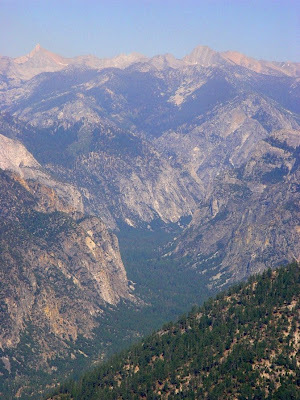 But...if you want to truly understand the history of the Sierra Nevada, there is a another canyon in the California mountains that has a greater diversity of rocks, more evidence of glaciers, far fewer crowds, and get this: it is more than twice as deep as Yosemite Valley! It is pictured above, and will be one of my contributions to a new revised "100 Places List". Please try to get your submissions in by February 25th. Happy hunting! 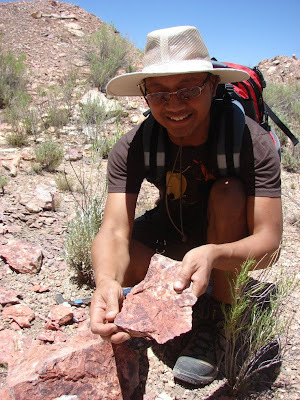 This month's Accretionary Wedge Carnival is being hosted by BrianR at Clastic Detritus, and involves speculation about the future of the earth in the context of geologic events and processes. 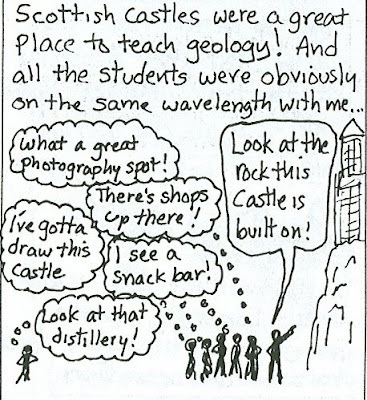 It is a delightfully open-ended idea, and one that I have used as a final exam question in my historical geology classes. After all, historical geology is an attempt on our part to understand the past history of the planet by observing present-processes (the simple definition of uniformitarianism, a founding principle of the science). But a part of the value of understanding the past and present is the ability to project into the future, and when I ask students to "predict" the future, it is an excellent gauge of their understanding of the basic principles of the class. Did they really understand the concept of geologic time? Do they understand the context of human existence with the vast flow of geologic time? Can they relate long-term changes of climate over periods of thousands or millions of years with climate change in a human context of a century or so? Will our activities leave a mark in the geologic record? Speculating about the future often is rather anthropomorphically-based: it's an ego trip. Will we as humans be around to see and observe the results of our present-day choices over a geologically extended period? I decided that would be the direction of my post...not whether we would be here so much, but would anyone else figure us out? I wrote in my last post about the mining of coal at Black Mesa on the Hopi and Navajo reservations in northern Arizona, and I chose one of my favorite chance pictures of the place to decorate this post. 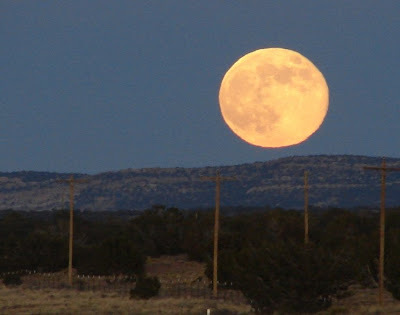 I was off to a late start on a 500-mile drive, and was only halfway to where I was going by the time the sun set and behind me I saw a bright light that proved to be the rising full moon. There weren't too many choices for parking and framing a picture, so I got what I got, with fences, telephone poles, and highway traffic (that I cropped out). The cliffs of Black Mesa form the horizon. The picture is a nice gathering of the elements for my speculation and musings that follow. The moon is a remote dead planet, remaining essentially unchanged for the last two billion years, aside from the occasional meteorite impact, and the footprints of a rather small number of humans. But it touches us through the tides, and as a source of light in the night-time. I am told that it is moving farther away from the earth at a rate of a few inches per year. So the tides will continue and the moon will rise in the sky on a regular basis for a long time. Some things don't change very much, even over millions of years. The fences, the telephone poles, the asphalt highway are all ephemeral monuments to our existence that will fade within a few decades or centuries. I'm not sure that the fast-food restaurants, motels and houses of the nearby town of Kayenta will even come close to outlasting the work of the Ancestral Puebloan people who built Chaco Canyon and Mesa Verde (I am reminded of the permit for my tract home in California that listed the expected existence of my house as being 40 years; yikes, I used up half of it already!). Is there anything that we will leave as a mark of our passing? The strip mine on Black Mesa might be something. In 40 years or so, the miners have moved mountains, in the most literal sense of the word. In a sense though, they are hiding the results of their labor as they back fill the coal pits to return the land to the original configuration. The geologists of some future species might detect our presence because of the disruption of the sedimentary sequence, since the coal will be missing, and the waste rock will be a jumbled chaos. There may be some symmetry in the pattern of the chaotic rock, with straight lines and corners representing the edges of the strip mine. But that will only be possible for a few more tens of thousands of years. In the fullness of time, the entire mesa will be disappearing, along with all signs of human existence. The entire region sits at an elevation of 6,000-7,000 feet above sea level, and is being vigorously eroded by the Colorado River and its tributaries. The massive dams at Lake Powell and Lake Mead will matter little in the long run. Filled with sediment in decades, and removed by erosion within a few thousand or tens of thousands of years, the dams cannot hold back the massive movement of sediment from the plateau to the sea. There have been dams before, made of lava flows, and they could not hold back the flowing rivers for long. In a few million years the entire region will have hundreds or thousands of feet of sediment removed and the only remaining clues of our existence there will be downstream somewhere. There will be floodplain deposits preserved in parts of the world that will contain deposits of concrete and metal, and even human bones, much as the dinosaurs and other terrestrial creatures have been preserved. I have no doubt that a layer will be discovered that represents a mass extinction event wherein a vast number of organisms disappeared forever, including the mammalian megafauna, and perhaps many oceanic species, especially at the top of the food chain, such as many kinds of sharks and whales. Will we be identified as the cause of the catastrophe? Who knows? Someone or something might figure it out. Or maybe not; it might be another of those mysteries that nag and bother the psyches of those who study the earth and it’s past. I'm going to close with a story from my youth. If you have stayed with my narrative for this long without laughing or sighing in frustration, well bear with me because you may laugh now. I figured it out once...I figured out as a 12-year-old why the dinosaurs disappeared from the earth (I'm old enough to remember when birds were not dinosaurian species in the eyes of paleontologists). The leaf broke loose from the branch, and fluttered slowly to the forest floor, a forest alive with hoots, howls and whistles from the myriad animal species that dwelt there. In the distance the crashing surf of a wide sandy beach could be heard . The constant rain of leaves and twigs on the forest floor accumulated over the millenia, never quite decaying away because of the moist, swampy oxygen-poor conditions that retarded the activity of bacteria. The carbon-rich layer persisted as the region was covered first by a brief advance of the seashore, than by later forests and swamps, then seas again, and then the world changed. The seas disappeared forever, and the land started to rise. And rise. Eventually the layer containing the leaf was pushed thousands of feet upward, erosion ate away at the rocks, and the sediment was left as part of a vast mesa, covering some 4,000 square miles. After being buried in total darkness for unmeasured eons, something happened; there was the sound of hammering, the rock split open, reflecting sunlight for the first time in 70 million years, and there it was: a fossil in the hands of a geology student. The huge bear-claw shaped plateau is called by the Navajo people Dziłíjiin, but is known to English-speakers as Black Mesa. The carbon-rich sediments, which are part of the Menefee Formation, are coal beds. And therein lies the source of generations worth of controversy and injustice. The coal is in seams that range from 3 to 18 feet thick, and the amounts are vast. At least one source I ran across suggests that 20 billion tons are present with a potential recovery value of at least 100 billion dollars. It is one of the largest coal deposits in the country. The coal has been mined since the 1970's. Some of the coal is carried by rail to a huge coal-burning power plant at Page, Arizona, next to Lake Powell. The remainder was ground into pebble sized chunks, and was transported in a slurry mix for 273 miles to a coal-burning power plant on the Colorado River in Laughlin, Nevada. It took something like a billion gallons of water every year to move the coal, water that could come only from underground in this semiarid country. This plant closed in 2005, pending negotiations for a renewal of the mining terms. The company that mines the coal frankly swindled the Navajo and Hopi people. The negotiations ended up providing a fraction of the usual royalties paid to landowners, and the groundwater was sold at rates far less than any farmer would ever pay. 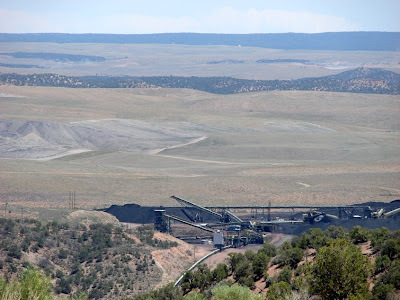 One of the more shameful aspects of the whole sordid affair emerged years later when it was revealed the lawyer representing the Hopi people in their negotiations with the coal companies turned out to be on the payroll of the coal company. The coal company is quick to note the wonderful benefits they provide to the Navajo and Hopi people. You can read their story here. By law, they must return the land to the original configuration, and they seem to be doing so. But the groundwater is not being replaced, and numerous springs on the mesa have already dried up. And the power plants are two of the biggest single sources of air pollution in the southwest. Some things never seem to change. It appears that Black Mesa was one of the final environmental victims of the Bush administration. A controversial environmental impact statement (EIS) was approved by the federal Office of Surface Mining on December 22, 2008 that helps clear the way for the company to expand by nearly 19,000 acres (roughly 30 square miles), displacing more Navajo families, and continuing to use up scarce groundwater resources. Then they wrote it all down as the progress of man." Update (1/27): As usual, I was writing fast and made an error in the post; the formations of the Mesa Verde Group go by different names in different areas (I knew that, darn it). At Black Mesa, they are called the Toreva Formation, the Wepo Formation, and the Yale Point Sandstone. The coal is mined from the Wepo, not the Menefee, although the units are broadly correlated. Thank you to Stephen for the heads up, and for an additional point of view (see comments). "Restore science to its rightful place..."
"We will restore science to its rightful place, and wield technology's wonders to raise healthcare's quality and lower its cost. We will harness the sun and the winds and the soil to fuel our cars and run our factories. And we will transform our schools and colleges and universities to meet the demands of a new age. All this we can do. All this we will do." The Others Aren't, But This Test is Really Important! These things are absolutely silly...until you do well on one, and then they are extremely significant and important. I got lucky on some of the questions; I've always known Sputnik went into space during the year of my birth, for instance. I don't do as well on computer-speak tests, but astronomy and the space sciences were literally the underpinning of my life as a child. Actually the quality of the questions was pretty good, and I have been declared to be Uber Space Nerd's Mentor! I often quiz my students early in the semester on the stereotypes they have about science, and two words that come up consistently are that doing science is "hard" and "boring". That allows me to "launch" into a discussion of how privileged we are to be living in the time we are living in. 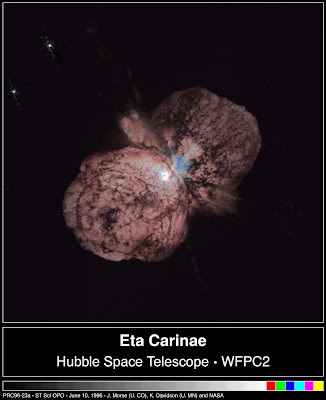 The riches of new data that have emerged in the last decade or two because of the Hubble Space Telescope, or the Spitzer Infrared, or the Mars Rovers, or the Saturn Cassini orbiter leave me awestruck, being someone who grew up in a time when the telescope images of the planets revealed only fuzzy featureless disks. And the accessibility! Gone is the time when the spectacular images could only be taken by multi-million dollar machines...technology has advanced to the point that my colleagues at the college have now produced images of planets and galaxies with their own equipment that rival the best stuff that Palomar ever did a few decades ago. A year or two ago, I was at Death Valley and an astronomy buff had set up his equipment, and started projecting the images he was taking in real time on a sheet on the side of a truck. On a sheet, and it was spectacular! Watch out for the Green Flash! 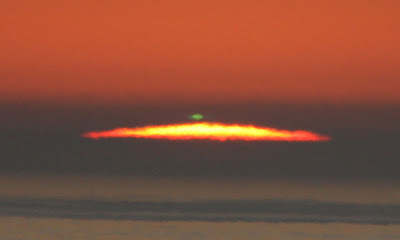 A few weeks ago, I stirred things up in the geoblogosphere with the 100 things a geologists should do meme, and number 100 on the list was to see the "green flash", a hard-to-see last-moment-of-the-sunset phenomenom that I have yet to witness, despite numerous attempts. One of my colleagues, Joel Hagen, caught the moment the other night and was kind enough to share with me, and also grant permission to post his photo of the event (please respect the copyright, check with me for contact information if you want to use the photo in some way). Some reaction around the geoblogosphere about the ranking of "geologist" as the 30th best career out of 200 various fields...dairy farming and lumberjacking rank the lowest. Perusing the list, I don't find my personal field specifically listed; although I think of myself as a geologist, I am actually a college professor who teaches geology, and "professor" isn't listed separately, although "Teacher" is listed at #127. On the other hand, "Mathematician" is numero uno on the list, and it specifically points out that many mathematicians work in an academic setting. Personally? I think I have one of the best jobs on the planet. I have had the privilege of introducing thousands of people to the world of geology and earth science over the last twenty years, both in the classroom and in the field, including a few far-flung locations overseas. Yes, there are moments of administrative/bureaucratic nonsense I could do without, but these things do not dominate my time. State funding cuts threaten our campus, but either we support education in our state or we go down the economic tubes, so I think there will a reasonable assurance of job security for the foreseeable future. It took me eight years of college (with economic-related breaks) to get the degree that allowed me to seek my job, but it has paid off with 24 years of an enjoyable career, with a hope of 20 more! 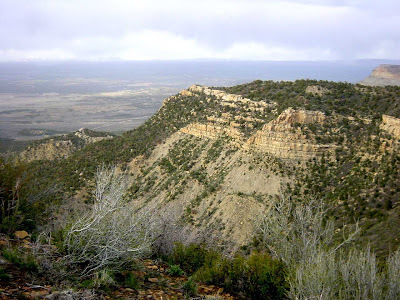 The Mancos Shale of the previous post is also an important component of the geology at one of the nation's premier national parks, Mesa Verde (tr: "green table"). The park is tucked away in the far southwest corner of Colorado adjacent to the Ute Reservation and the towns of Cortez and Mancos (from which the shale takes its name). 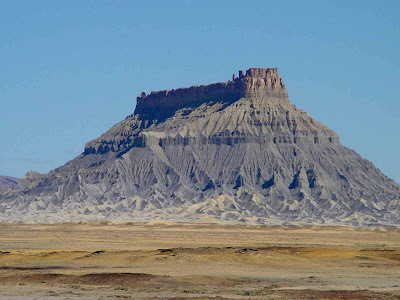 The high mesa (8,000 feet +) slopes south towards the desert region of Four Corners and the Navajo Reservation, and is dissected by a series of deep canyons which also drain towards the desert. The mesa lies at the east end of the "fertile crescent" mentioned previously here and here, where conditions were ideal for growing squash, beans and corn. At Hovenweep and Canyons of the Ancients, the soils formed on the surface of the Dakota Sandstone. At Mesa Verde, the Mancos covers the Dakota, and is in turn covered by three formations that represent the receding shorelines and river floodplains that lined the Western Cretaceous Seaway, the Cliff House Sandstone, the Menefee Formation, and the Point Lookout Sandstone. The formations are found elsewhere, with different names, but the three together are usually referred to as the Mesa Verde Group. The sandstones are resistant to erosion and form prominent cliffs wherever canyons have been carved. Water moves freely through the sands until it reaches a clay rich layer (like the Mancos) and then moves sideways until it can drain into the canyons as springs. The cement holding the sands together is easily dissolved at such sites, and as the sand washes away, prominent alcoves have developed (the National Park Service has a nice review of the geology here). 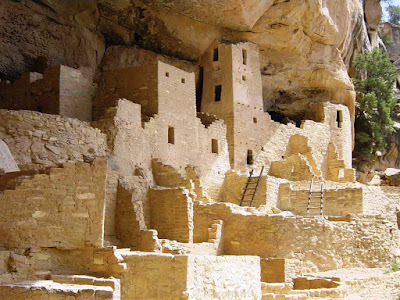 Although the region is steeped in beautiful scenery, Mesa Verde was established as a national park in 1906 for the purpose of protected the spectacular cliff dwellings of the Ancestral Pueblo people. The mesa, as mentioned before, was a good site for agriculture. It was sort of a compromise; low enough to have a long growing season, but high enough to receive sufficent moisture in most years. Nomadic peoples had moved through the area over thousands of years hunting and foraging, but the region was not settled in a permanent way until about 550AD (see here for a nice NPS review of the archaeology). It is not usually recognized, but for 500 years the Puebloan people did not live in cliff dwellings at all. They first lived in pit houses on the mesa surface, and later built small villages, also on the mesa surface. 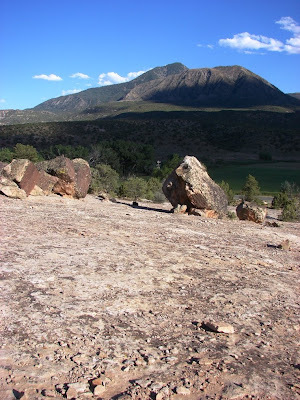 Looking at the semiarid forest of pinon and juniper that covers the surface of the plateau today, it is hard to believe that at one time, most of the park area was under cultivation. The farmers built reservoirs and check dams to prevent soil erosion, and most of the land was being used to support the population. 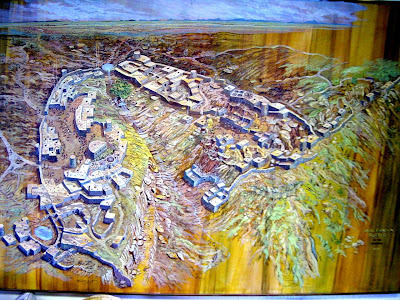 The cliff dwellings for which the park is most famous were generally built during the final century of habitation, from around 1190 to 1270 AD. The dwellings certainly look defensive in nature, and when they were abandoned, so was the entire region. The reasons are not clearly known, but drought, resource depletion, warfare, or disease may have played a part. The survivors moved south and west to Arizona (the Hopi) and New Mexico (the Pueblo people) where they live today. Something like 4,700 archaeological sites have been identified in the park, of which 600 are the popular cliff dwellings. Many sites were exposed in the last decade or so when something like two-thirds of the park burned in a series of intense fires. Although the fires severely damaged many sites, others were found for the first time. Many of the sites were severely vandalized by pot-hunters before the park was established, and the park service is vigilant about protecting what remains. 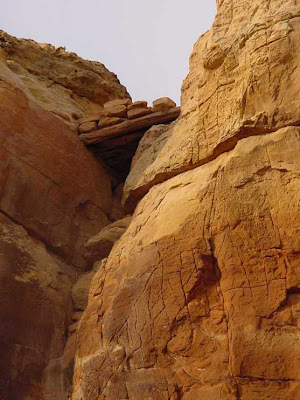 Most of the dwellings and village sites are closed to visitation, but numerous pullouts on park roads allow visitors to look down into the alcoves. A number of the mesa-top sites can be accessed from the park roads. Spruce Tree, Cliff Palace, Long House and Balcony House are four of the larger alcove villages that can be toured (reservations required for the last three). Speaking from personal experience, Balcony House is one of the best tours, as you get a real sense of the inaccessibility of the villages: you must climb several tall ladders to get into the alcove, and must crawl through a few passageways to see the entire village. If you visit the area with a geology crew, the park has a nice campground which is rarely crowded, with showers and a grocery store nearby. Motels and supplies are available in Cortez, Mancos or Durango. Oh, and try the Navajo Tacos at the Farview Lodge! Ah, the Mancos Shale. Woe unto anyone who tries to foolishly drive across it after a rainstorm. Deep disappointment faces fools who try to build a highway or dwelling on the black clay. Frustration to anyone who tries to grow anything on it. And poor health to those who must drink of water that emanates from or passes through it, with its load of poisonous metals. A former colleague who had worked in the region during the uranium boom could only call it the "d----d Mancos Shale". When the Cretaceous Seaway expanded from the north and south, it inundated the central part of the North American continent, dividing it in two. To the west, high mountains and volcanoes produced vast amounts of mud and silt that drifted into the open water beyond the shoreline sands (represented by the Dakota Sandstone). The organic-rich sediments ultimately accumulated to depths of thousands of feet. Numerous creatures lived in the waters, including the usual snails, clams and oysters, numerous kinds of fish and sharks, but the most interesting fossils include the billions of ammonites (best thought of as octopi with shells; the Pearly Nautilus is a modern relative), and giant mosasaurs, the sea-going varanid lizards (think of a Komodo Dragon with fins). The clay-rich sediment absorbs water to an extraordinary degree, and swells when wet. It thus gets mucky, and roads cut through it become impassable. Buildings settle and crack on the unstable surface. The clay contains all manner of nasty metals like selenium, arsenic and mercury, which can be absorbed by crops, and contaminate water supplies. And yet, in the right circumstance, the Mancos is a beautiful rock to behold (as Silver Fox can attest). At Capitol Reef National Park, the Mancos is revealed in cliffs and badlands as an intricate maze of gullies and slopes. In the pictures above, tilted layers of Mancos are found along the eastern boundary region of the park. Factory Butte is one of the premier landmarks in the Bureau of Land Management lands east of the park (and is the site of a controversy over land-use policies and off-road-vehicle use). Mesa Verde National Park, famous for the Ancestral Pueblo Cliff Dwellings, is also a place where the Mancos is a prominent part of the scenery. More in future posts! Oh, my former colleague? Many years ago, we convinced him to join us on a field trip that included stops in the Mancos. He was reluctant, but came along. At some point, the students found a nice slope of the clay, and they started climbing and then running down (we aren't necessarily describing mature behaviour, but we've all done it...). We thought it would contribute to Will's healing of his hatred of the Mancos if he actually had some fun on it, so we egged him on, and he climbed the slope and came barreling down at a high rate of speed. He lost his footing, and tumbled down, cutting up his leg. I wouldn't give the time of day to anyone who wanted to endorse a product on my blog, but today I will volunteer one! 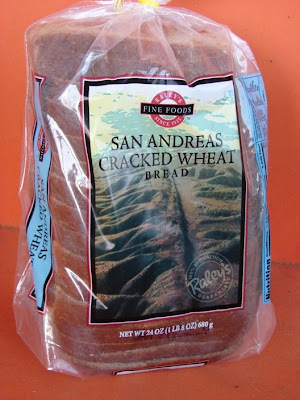 I was grocery shopping at my Raley's grocery store (a local California-Nevada chain), and found the loaf of bread pictured above. I was particularly impressed with the choice of photos, an aerial shot of the San Andreas fault where it crosses the Carrizo Plains in the southern Coast Ranges. The linear valley and offset stream channels are clearly evident. Located next to a paved highway and agricultural fields, it lies hidden in plain sight, protected by a thick growth of cacti, and buried in the debris of the fallen buildings. 700 years ago, a frightened people constructed the village on a barren stretch of slickrock along McElmo Creek in southwest Colorado. It contained at least 16 kivas, 40 surface rooms, and nine towers and probably housed 75-150 people. They occupied the site for no more than 30 years, and the ending was horrific. 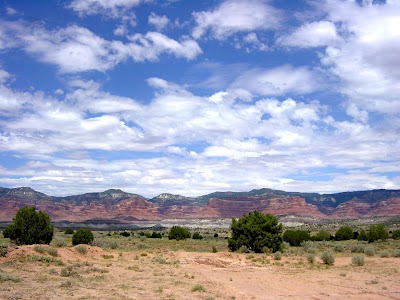 This post is part of a series on the geology of the Colorado Plateau. Although much of my narrative has involved the story in the rocks and events of millions or billions of years ago, there are times when the rocks become part of the human story, and such is the case here. Canyons of the Ancients National Monument was established to preserve some 6,000 archaeological sites in southwest Colorado, but geology was instrumental in the development of human societies in the area. The caprock in the area, the Dakota Sandstone, is topped by rich soils that were capable of supporting a rich agricultural base consisting of beans, squash, and corn. At least until drought and environmental degradation caused the crops to fail. And then chaos seems to have taken over the people of the region. The Castle Rock Pueblo is certainly not a striking visual presence. Your eyes are actually drawn to the natural rock tower and the barren slickrock flats on which the village was constructed. The realization comes slowly that the small stones piled along the margins are not geologically "right", being nearly all of similar size, with none of the characteristic shapes of talus slopes (keep in mind that I am speaking of the eyes of a geologist; I have no doubt a trained archaeologist would see the human origin of the rockpile in a millisecond). Coming closer, one begins to see platforms and walls hidden in the fractures of the sandstone cliff. Finally at the base of the cliff, on hands and knees, one sees the fragments of pottery that show that people once lived here. 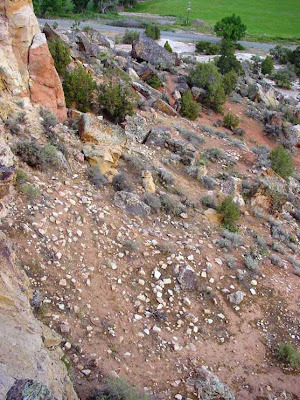 The site was excavated in 1990-94 by the researchers at the Crow Canyon Archaeological Center, and a detailed report has been posted on the web (here). The site was of interest because it had a chance to shed light on the depopulation of the region in the 1280's, given the brief period it was inhabited. Couched in the spare language of the scientific researcher, a sad tale emerges: at least 41 people died a violent death at the time that the village was abandoned. It was not the first time the population was attacked: many of the victims had healed from earlier injuries. So many stories of human triumph and tragedy have been lost to history, but the horrible end for the inhabitants of the Castle Rock Pueblo was not forgotten. Their story was told by the survivors and has been passed on through the generations to the present day, so that it is one of the very few such ruins with a known oral tradition. The story is one of a siege by foreign invaders, of defending the town for weeks while children and families were evacuated to the south. Addendum: If you are paying close attention, you may noted that the Castle Rock site is actually built on Navajo Sandstone and Entrada Sandstone. It lies in a deeply cut canyon below the Sand Canyon site of the previous posts and thus is in older rock. The Geoblogosphere really seems to have taken off this year; Callan Bentley at NOVA Geoblog, Lost Geologist, Looking for Detachment, and Dinochick, and several others started about a year ago, and so did I, with these posts on January 7, 2008. The onset of my blogging coincided in my case with the acquisition of a new laptop that was actually capable of holding all my pictures. The first comment appeared three days later (from Anonymous), and I was uncommonly pleased to be noticed at last! 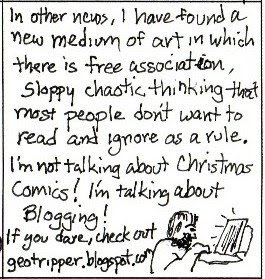 My banner was a morning shot from the summit of Haleakala on Maui, and as an outlet for any creative impulses, the blogging almost replaced my once-a-year stint as a Christmas Comic maker, but not quite. I started the blog as an effort to make geology and the other earth sciences more accessible to the lay public, oh, and to show pictures of my field experiences. 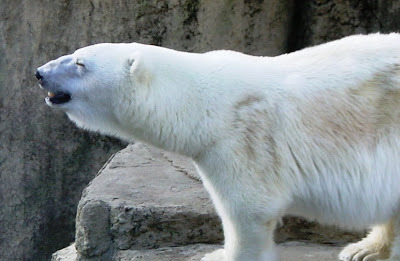 Blogging feeds my geological attention deficit disorder; I don't have the concentration to do continuous research on a single subject, but I do enjoy flitting from one subject to another, and blogging is wonderful way to do so. I followed a few themes at times; the Airliner Chronicles was one of my early favorites, as was an exploration of some of the unfamiliar sights in Yosemite National Park (Under the Volcano). The longest running theme has been the still-ongoing exploration of the geology of the Colorado Plateau, which started in June. I'm up to the Late Cretaceous, and the end may be in sight! I started a few memes, not always on purpose, but it was fun to hear the great stories that were generated by my fellow bloggers, especially those of the death-defying geologists. The most attention of any of my blogs ever garnered seems to have been the 100 things list that geologists ought to see, an idea borrowed from an article in Geotimes a decade ago. I'm still getting comments and I enjoy all those stories too! People who reach my blog via some kind of word search most often hit one of my earliest blog entries, on the journey of the marsupials from China to Australia. I am at a loss to explain why, because no one ever commented on the blog itself (if you Google "marsupial geology", the post is the seventh hit). This has been a lot of fun, not just the blogging, but to see the exploration of the world throughout the geoblogosphere. Many thanks are due to Chris at Highly Allochthonous for his blog feed, and also to the producers of the Geoblogosphere News. Both sites have become indispensible sources of news in the earth sciences. I fervently thank everyone who has paid a visit to my site, and appreciate more than you can know the comments and conversations that have taken place here. 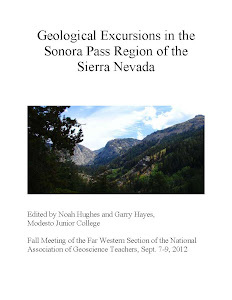 I regret that I missed the meeting of the geobloggers in San Francisco, but if your road ever takes you to Modesto or Yosemite, contact me and pay a visit! And, if you are tempted, give it a shot: blogging is fun! A walled city of 400-500 people, surrounded by tilled fields, and constantly subject to attack during its short existence in the 13th century. A castle complex in England or France? No, it is one of the more intriguing sites on the Colorado Plateau that is almost unknown to the millions of tourists who pass through the region every year. 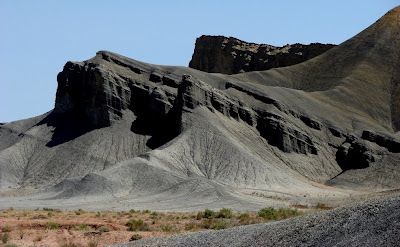 We have been working our way through the geological history of the Colorado Plateau, and in our most recent posts we have been reviewing the late Cretaceous sediments that formed along the margins of an inland sea that divided the North American continent into two. The Dakota Sandstone originated in the beaches of that sea, and forms an important capstone across the "fertile crescent" of southern Colorado and Utah. It is covered by the rich Dove Creek Soils that provided the Ancestral Pueblo people with corn, squash and beans (beans are still grown across the region today). I have had only a few opportunities to explore the mysteries of Canyons of the Ancients, but I learned more in those few trips about life in the Southwest than pretty much all of my previous journeys in the region. With little prior background, I participated in a geo-archaeological field trip to the head of Sand Canyon in 2003. We first paid a visit to the Crow Canyon Archaeological Center, which has conducted many of the surveys of the ruins in the monument. Along with the Anasazi Heritage Center, it serves as source of information on the park. We drove across the beanfields, and I quickly became aware that ancient villages were scattered everywhere across the mesa surface, including right in the middle of some of the modern pastures as sage-covered mounds that the farmer's plows avoided. 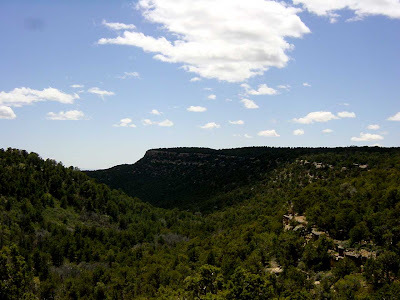 When we reached the end of the road, we got out of our vehicles, and wandered through the pinon forest to the upper rim of Sand Canyon. It was a little tricky finding a pathway through the boulders and rocks that lay scattered across the surface. Still kind of ignorant, I had not stopped to think how boulders and rocks did not fit with the topography, which was composed primarily of fine-grained soils. It was at that moment that our trip leader pointed out that we had reached the center plaza of a huge Ancestral Pueblo village that once housed 400-500 people. Looking around, I realized that every single boulder and rock around me was once part of a wall or a kiva. Look at the two photos above. 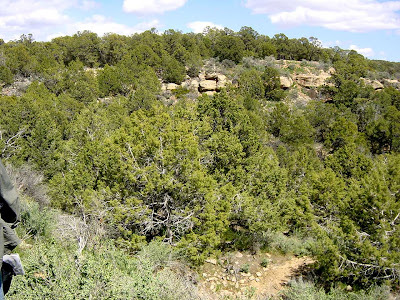 Hidden beneath a pinon forest, little evidence can be seen indicating the presence of a village. It was an amazing complex. An eight-to-ten foot high masonry wall surrounded the entire city. Water for the hundreds of people was provided by a single spring that was fed by the groundwater from an area of only a few acres. The village contained some 420 rooms, 95 ceremonial kivas and 14 towers. And yet it was built and then abandoned within a period of only 30 or 50 years in the late 1200's. Things did not go well at the end; environmental degradation and drought had caused stressful conditions, and evidence found at the site suggested the population was an aggregation of several scattered smaller villages in the region, come together for defensive purposes. Researchers also found evidence that an attack may have brought an end to the existence of the village itself, with burning of buildings and unburied bodies, victims of a violent death. I don't know that I ever could have had the patience to do the actual excavation work, but the science of archaeology has always fascinated me. In so many ways the methods and technology of archaeology parallel those used in historical geology and paleontology, but there is an emotional component to archaeology that doesn't exist in fossil work. We are working with the remains of our immediate ancestors. They lived lives different from ours, and yet there are enough clues to understand something of their beliefs and hopes and fears. We drove back to our dorm at Fort Lewis College in Durango. It was an enlightening trip. 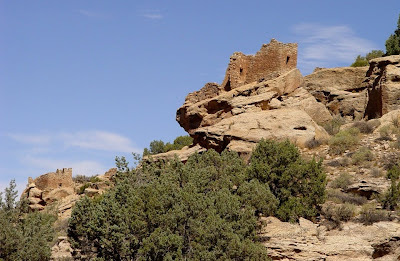 In the next post, a discussion of another site at Canyons of the Ancients, the Castle Rock Complex. Sometimes news gets past me. Sometimes I wish it didn't. I was reviewing some of those end-of-the-year lists of who passed on during the year and found to my dismay that author Tony Hillerman died in late October at the age of 83. Those of you who follow my blog know that I love the Colorado Plateau country, and Mr. Hillerman wrote wonderful novels set in the region. His murder mysteries chronicling the adventures of Navajo policemen Joe Leaphorn and Jim Chee fascinated me for years. He evoked the land and the native American people in a way that few Anglos could. I always looked forward to each new novel in the series. 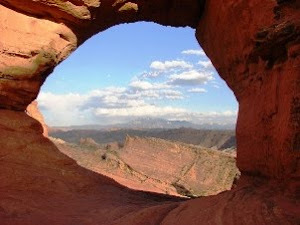 One of my favorites was A Thief of Time, which was set in the vicinity of Bluff, Utah and on the San Juan River near Mexican Hat. Having rafted that part of the river, I knew the landscape well. It dealt with the issue of illegal plundering of archaeological sites in the southwest, a problem that continues more or less unabated today. During my trip down the river, I was admiring one of the complex cliff dwellings, wondering how it survived through the years. Then I was told that the walls had been repaired several times after someone knocked them down with a bulldozer looking for pottery. Hillerman's novels were chronological, and we aged with the principle characters. From book to book we were left to wonder what would happen next to Jim, Joe, Janice Pete, Bernie Manuelito and the other complex characters he created over the years. He wrote 18 of the Chee/Leaphorn novels starting with The Blessing Way in 1970. His last was The Shape Shifter in 2006. Any of them are worth your time, whether you enjoy the settings, or the often complicated plots. The picture shows a part of the Chuska Mountains near the heart of the Navajo Reservation on the Arizona/New Mexico border. Looking for a good fixer-upper in Utah/Colorado? Have I got a place for you! This is one of a continuing series on the geology of the Colorado Plateau. It's taking a lot longer than I thought it would, and I thank you for your patience if you are still following the story! For several months we have been making our way forward through geologic time via some of the most beautiful places on the planet. For the early Cretaceous, we took a brief foray into Montana for a 1994 dinosaur dig in a layer (the Cloverly Formation) that was a substitute for the very similar Cedar Mountain Formation of the Colorado Plateau. The remaining Cretaceous layers of the Colorado Plateau reveal events that ultimately separated the North American continent into two parts, with a shallow sea that ran from Canada to Mexico. The fluctuating shoreline left a mixture of sands, silt and mud that accumulated to depths of several thousand feet. When the land was exposed, plants grew in profusion in the tropical conditions. Coastal lagoons and swamps produced a rock that would eventually be a two-edged sword to the inhabitants of the region: coal. The formations include the Dakota Sandstone, the Mancos Shale, and the Mesa Verde Group (which includes a number of- formations that go by several names in different parts of the plateau region). The story began with the rise of a mountain range in far west California and Nevada…where the Sierra Nevada stands today, a series of volcanoes spewed ash and lava. Deep underground, the magma cooled slowly to form the granitic rocks that make up the mountains we know today in places like Yosemite and Sequoia National Parks. Intense compression of the crust east of the Sierras in Nevada and western Utah caused huge sheets of crust to slide over each other forming a second series of mountains that shed vast amounts of sediment across what is now the plateau country. The Dakota Sandstone and related formations are found across the region, from Montana to Arizona, and well into the Great Plains. It is usually exposed as a yellowish sandstone with prominent crossbedding. It formed as sea level rose and spread a blanket of beach sands across the region. Dinosaurs wandered across these beaches, but left only footprints and practically nothing else. No one would mistake it for a grand scenery-maker like the Navajo Sandstone, but it is a significant part of two unique national monuments: Hovenweep and Canyons of the Ancients. Neither park is known for its geology; they were established for the Ancestral Puebloan (Anasazi) ruins that are found there. But geology played an important part in the life of the people who lived there centuries ago. At Hovenweep, the only layers are the Dakota Sandstone and the underlying Morrison Formation. The Dakota forms a resistant caprock that is topped by rich soils. In places, canyons have been carved into the softer rock underneath. 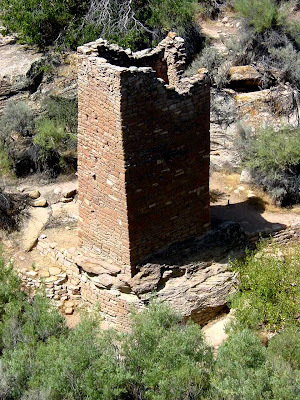 The best-known ruins surround the head of Little Ruins Canyon, at the park visitor center and campground complex. People live with the resources they have in the regions in they inhabit, and one can appreciate the difficulties of life in this harsh environment. But, despite the cold winters and hot summers, the soils were in an ideal location for growing beans and corn; high enough above the desert to get sufficient moisture, but low enough to have a longer growing season. 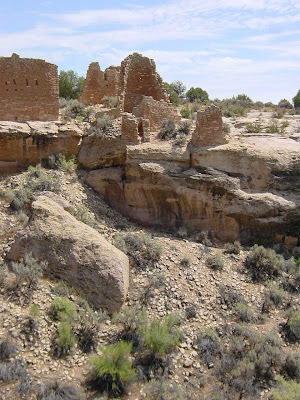 Hovenweep sits in the middle of a “fertile crescent” that extended from Utah’s Cedar Mesa to Mesa Verde in Colorado. Thousands of people once lived here, and the land supported their needs, but droughts or other factors caused them to abandon the region in the 1300’s. However much we may idealize their existence, one cannot deny the artistry of their architecture. Their structures follow the boulders and are built so well that they have perched there for centuries. So much is not known about their choices; why on the rocks? Defense seems the most logical reason, but defense from whom? And why put a four-story tower inside a canyon, rather than on the rim, where you could use it as a lookout? Hovenweep is one of those overlooked gems of the National Park System. If you ever visit Mesa Verde National Park or Natural Bridges National Monument, it isn't much farther to get to Hovenweep, and is well worth the effort. Many of the ruins remain unexcavated, and the feel is far more wild than the paved trails of Mesa Verde. Canyons of the Ancients will be covered in the next post!